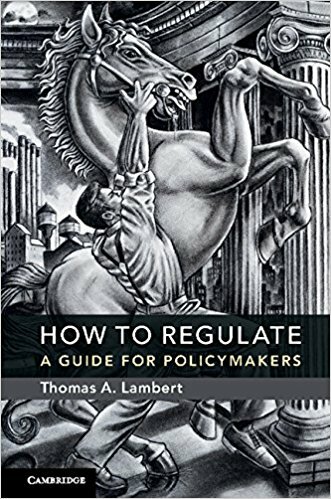 My new book, How to Regulate: A Guide for Policymakers, is now available on Amazon. Inform Santa! The book, published by Cambridge University Press, attempts to fill what I think is a huge hole in legal education: It focuses on the substance of regulation and sets forth principles for designing regulatory approaches that will maximize social welfare. Lawyers and law professors obsess over process. (If you doubt that, sit in on a law school faculty meeting sometime!) That obsession may be appropriate; process often determines substance. Rarely, though, do lawyers receive training in how to design the substance of a rule or standard to address some welfare-reducing defect in private ordering. That’s a shame, because lawyers frequently take the lead in crafting regulatory approaches. They need to understand (1) why the unfortunate situation is occurring, (2) what options are available for addressing it, and (3) what are the downsides to each of the options. Enter How to Regulate. The book endeavors to provide economic training to the lawyers writing rules and a sense of the “limits of law” to the economists advising them. The book begins by setting forth an overarching goal for regulation (minimize the sum of error and decision costs) and a general plan for achieving that goal (think like a physician–identify the adverse symptom, diagnose the disease, consider the range of available remedies, and assess the side effects of each). It then marches through six major bases for regulating: externalities, public goods, market power, information asymmetry, agency costs, and the cognitive and volitional quirks observed by behavioral economists. For each of those bases for regulation, the book considers the symptoms that might justify a regulatory approach, the disease causing those symptoms (i.e., the underlying economics), the range of available remedies (the policy tools available), and the side effects of each (e.g., public choice concerns, mistakes from knowledge limitations). I have been teaching How to Regulate this semester, and it’s been a blast. Unfortunately, all of my students are in their last year of law school. The book would be most meaningful, I think, to an upcoming second-year student. It really lays out the basis for a number of areas of law beyond the common law: environmental law, antitrust, corporate law, securities regulation, food labeling laws, consumer protection statutes, etc. I was heartened to receive endorsements from a couple of very fine thinkers on regulation, both of whom have headed the Office of Information and Regulatory Affairs (the White House’s chief regulatory review body). They also happen to occupy different spots on the ideological spectrum. Bottom line: There’s something for everybody in this book. I wrote it because I think the ideas are important and under-studied. And I really tried to make it as accessible (and occasionally funny!) as possible. If you’re a professor and would be interested in a review copy for potential use in a class, or if you’re a potential reviewer, shoot me an email and I’ll request a review copy for you. I didn’t know Fred as well as most of the others who have provided such fine tributes here. As they have attested, he was a first-rate scholar, an inspiring teaching, and a devoted friend. From my own experience with him, I can add that he was deliberate about investing in the next generation of market-oriented scholars. I’m the beneficiary of that investment. My first encounter with Fred came in 1994, when I was fresh out of college and working as a research fellow at Washington University’s Center for the Study of American Business. I was trying to assess the common law’s effectiveness at dealing with the externalities that are now addressed through complex environmental statutes and regulations. My longtime mentor, P.J. Hill, recommended that I call Fred for help. Fred was happy to drop what he was doing in order to explain to an ignorant 22 year-old how the common law’s property rights-based doctrines could address a great many environmental problems. After completing law school and a judicial clerkship, I took a one-year Olin Fellowship at Northwestern, where Fred was teaching. Once again, he took time to help a newbie formulate ideas for articles and structure arguments. But for the publications I produced at Northwestern, I probably couldn’t have landed a job teaching law. And without Fred’s help, those publications wouldn’t have been nearly as strong. A few years ago, Fred invited me to join as co-author of the fifth edition of his excellent antitrust casebook (co-authored with the magnificent Charlie Goetz). How excited was I! My initial excitement was over the opportunity to attach my name to two giants in the field. What I didn’t realize at the time was how much I would learn from Fred and Charlie, both brilliant thinkers and lucid writers. Fred and Charlie’s casebook continually emphasizes the decision-theoretic approach to antitrust – i.e., the view that antitrust rules and standards should be crafted so as to minimize the sum of error and decision costs. As I worked on the casebook, my understanding of that regulatory approach deepened. My recently published book, How to Regulate, extends the approach outside the antitrust context. But for the experience working with Fred and Charlie on their casebook, I may never have recognized the broad applicability of the error cost approach to regulation, and I may never have completed How to Regulate. In real life, people don’t get the sort of experience George Bailey had in It’s a Wonderful Life. We never learn what people would have been like had we not influenced them. I know for sure, though, that I would not be where I am today without Fred McChesney’s willingness to help me along the way. I am most grateful. University professors often post things on their office doors—photos, news clippings, conference posters, political cartoons. I’ve never been much for that. The objective, I assume, is to express something about yourself: who you are, what interests you, what values you hold. I’ve never participated in this custom because I haven’t wanted to alienate students who might not share my views. That’s not to suggest that I’m shy about those views. I will—and regularly do—share them with students, even those who I know disagree with me. But if posting my views on the door were to dissuade students from coming to me to discuss those views (and contrary ones), I would be losing the opportunity to have a meaningful dialogue. Plus, my tastes veer toward minimalism, and doors covered with postings are ugly. Thus, no postings. Until today. My institution, the University of Missouri, is at a crossroads. We can be a place where ideas—even unpopular ones—are freely expressed, exchanged, and scrutinized. Or we can be a place where everyone’s feelings are protected at all times. It’s one or the other. Give the communications operator a summary of the incident, including location. Provide a detailed description of the individual(s) involved. Provide a license plate and vehicle descriptions (if appropriate). If possible and if it can be done safely, take a photo of the individual(s) with your cell phone. Delays, including posting information to social media, can often reduce the chances of identifying the responsible parties. While cases of hateful and hurtful speech are not crimes, if the individual(s) identified are students, MU’s Office of Student Conduct can take disciplinary action. As it turns out, it was no joke. Anyone on my campus who witnesses “hurtful speech” is directed to call campus police—individuals who carry guns, drive squad cars, and regularly arrest people. Now rest assured, “cases of hateful and hurtful speech are not crimes.” They can give rise to, at most, “disciplinary action” by the MU Office of Student Conduct. But still, isn’t it a bit unsettling—chilling, even—to think that if you say something “hurtful” at Mizzou (e.g., gay marriage is an abomination, affirmative action is unfair and hurts those it is ostensibly designed to help, Christians who oppose gay marriage are bigots, Islam is not a religion of peace, white men are privileged in a way that leads to undeserved rewards, culture matters in cultivating success, Republicans are dumb), the police may track you down and you may be required to defend yourself before the student conduct committee? 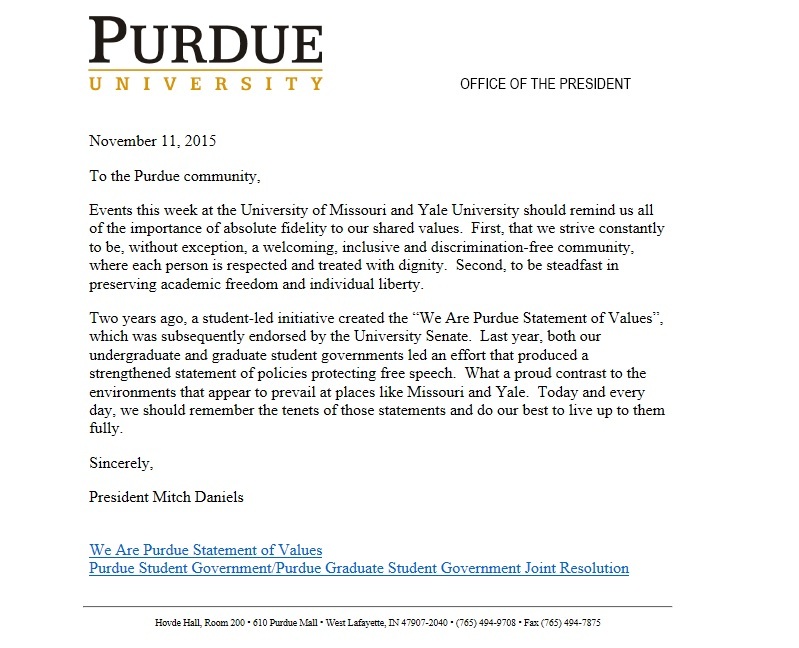 Perhaps the MU Police, or whoever crafted that email (let’s get real…it wasn’t the police), didn’t really mean that all hurtful speech is potentially problematic. But if that’s the case, then why did they word the email as they did? Pandering to an unreasonable element, maybe? The contrast between Mizzou and Purdue couldn’t be starker. And it really, really matters. I hope that posting these two documents on my door (along with this spot-on Wall Street Journal editorial) will not dissuade students from engaging in dialogue with me. But I can’t be demure on this one. So I now have—much to my aesthetic chagrin—a decorated office door. Please come in and talk, even if you think I’m wrong.